CII delegation from J&K posing with MP Shamsher Singh Manhas. JAMMU, Sept 1: A delegation of CII comprising senior Industry leaders from J&K met with Shamsher Singh Manhas, Member Parliament, and sought support to develop the industrial sector of J&K. The delegation led by Rajesh Sharma, vice chairman, CII J&K State Council, apprised the MP about various macro level challenges and issues faced by the industries of the State. The delegation expressed the need to capitalize the inherent strengths of J&K which primarily includes Tourism, Food Processing, Horticulture & Agro – based Industries. Issues related to GST including reduction of GST rate on almond kernels from 12 % to 5 % and exemption of fortified wheat flour from the purview of GST regime at par with milk as per FSSAI guidelines were also taken up with the MP. Apprising him about declining condition of Industrial sector in the State, the delegation members sought Special Industrial Policy for J&K on the Iines of North East Policy, which they said, is required for the growth of industrial sector in J&K. Furthermore, the delegation stressed upon the need to extend the central excise exemption to new industrial units established after 2010 for giving support to the budding industries and making them competitive. They also sought various fiscal incentives like reimbursement of 2% of the value of Invoice to Industrial units on their produce in lieu of 2 % CST which was exempted to local industries, reimbursement of Centre’s share of income tax for first five years and transport subsidy to finished goods exported by the industries located in J&K. 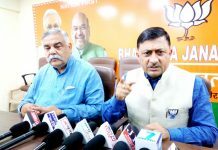 While responding to the issues raised, Shamsher Singh Manhas assured his support to the industry of the State and asked the delegation to submit needful representations for taking the concerns ahead. Rahul Sahai, Sanay Puri, Raju Choudhary, Anil Mahajan, Vicky Mahajan, Sujiv Jain, Ravnish Gulati, Abhinandan Sachdeva, Gourav Khajuria, Vinay Sharma, Narendra Brahmbhatt, Darshan Lal, Harbinder Singh, Gourav Sehgal, Noureen Rehman, Mahak Mahajan, Ravi Ranjan and Vivek Bhardwaj were part of the delegation.